A black and white negative of the Richardson family standing in front of a tree. In this view Mrs. Richardson is looking up at her son, Harold Richardson. William Joshua Harold Richardson (1874-1953) was born in a house on Garden Street at Dundas Street in Whitby on November 26, 1874. After graduating from Upper Canada College in Toronto he opened a stationary store in Whitby and later an insurance business. Mr. Richardson was a member of the Town Council and the Public School Board as well as the board of Heydenshore Park. He was a very influential Whitby citizen. Mr. Richardson died at Oshawa on May 26, 1953 and is buried at Union Cemetery, Oshawa. Frances McFarland Bowes (1877-1961) was born at Maxwell, ON on 9 March 1877. She married William Joshua Harold Richardson at Milton, ON on 16 June 1900, after which the couple moved to Whitby. Frances died on 17 January 1961 at Oshawa General Hospital following a motor vehicle accident which occurred 16 December 1960. She is buried at Union Cemetery in Oshawa. William Joshua Harold and Frances Richardson had two children Harold H.J. (1902- ) and Emily Helena Richardson (1905-1956). 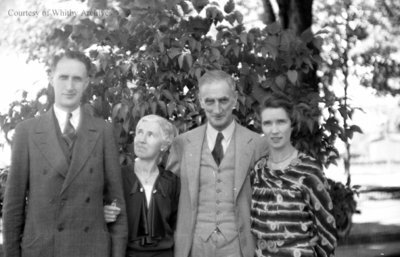 Richardson Family, October 1937, Marjorie Ruddy. Whitby Archives A2013_040_175A.